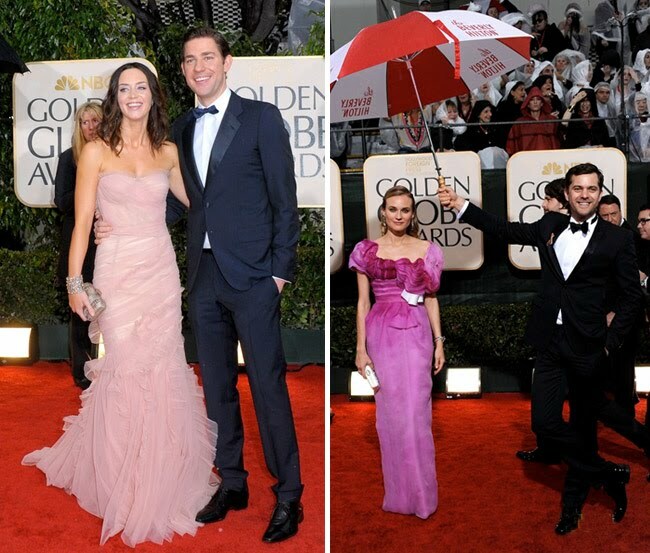 John Krasinski and Emily Blunt (who are engaged – can’t wait to see what they wear!) were my favorite of the night. Her pink tulle and chiffon strapless gown with ruffle detail by Dolce & Gabbana paired with John’s Prada navy two-button tuxedo was so perfect. I think they could wear this for their wedding! And I just love this picture of Diane Kruger and Joshua Jackson having some fun with the rain :) Diane is wearing a stunning Christian Lacroix dress. I honestly was loving the fashion a bit more from the Critics Choice awards on Friday. I love Zoe Saldana’s Jason Wu dress – it would be perfect for a rehearsal dinner or chic wedding. And the vintage inspiration from Marion Cotillard’s Christian Dior dress and Emily Blunt’s George Chakra dress. I think Emily Blunt might be a new favorite of mine! What did you guys think? Find any inspiration from the Red Carpet this weekend? I was totally into the fashion from the people's choice awards too! There were a lot of definite don'ts at the golden globes. However, Emily Blunt's dress was my fave. So romantic and whimsical! I see a hint of peacock in the silvery dress- lovely! several of my 2010 cupcake brides are working peacock feathers and colors into their weddings. The women of Mad Men didn't disappoint. January Jones looked stunning as usual. Her up-do (French twist with black sash) would make for beautifully classic "bridal hair." Christina Hendricks' peachy champagne dress (by Christian Soriano) was perfect on her. I also loved Heidi Klum's gray dress worn with her hair down in natural waves. I thought, overall, the Golden Globes turned out plenty of fashion hits and, of course, some misses: Mariah Carey, Fergie, Marion Cotiard, to name a few. I love it all! Gorgeous pics! Marion Cotiard looked amazing! I also loved Sandra Bullock's dress! Mariah looked a mess, waaay too much cleavage as usual! Personally, I didn't like Marion's slip and corset showing. Even if it was intended, it totally looked like a wardrobe malfunction! I thought Ginnifer Goodwin looked stunning at the Globes. She is so classically beautiful and always elegant in such an understated way. I loved Both of Emily Blunts Look and Maggie Gyllenhaal's origami inspired dress. Im usually not a pink fan but both were stunning. I also loved Anna Paquins gold dress but her shoes were terrible! toni collette was one of the best dressed last night! her sparkly dress was beautiful. and helen mirren looked simple yet GORGEOUS, she has an amazing figure and is so very elegant. can i look like her when I'M in my 60s? while i keep hearing how everyone hated sandra bullock's dress, i absolutely loved it. the color was incredible on her and i loved how flowy it was. I loved Sandra Bullock and Emily Blunt's dresses. However…Fergie looked like she was going to prom. Love Jason Wu's creation on Zoe Saldana. Call me crazy, but I swore I saw a shot of someone wearing a 2010 Claire Pettibone dress. I think it was a super quick clip on the E Fashion Police show. Tara- I don't remember seeing any of Claire's dresses, but if someone does, I'd love to know which dress. Love her dresses! Emily Blunt's pink tulle and chiffon strapless gown from Dolce & Gabbana is to die for. So feminine and sensual at the same time. Wow, I would love to wear something like this. The design is remarkable because it can also be used for weddings. I simply love it!!! I wait for award season to see some fresh houte couture dresses on real people (well, not absolutely real, but more real then models). Or to see how one or other star will bring out some vintage couture dress that looks super fashionable in today’s context again… Or just to see something more then you can see in every celebrity party. Yes, there were no wows. But at least this year there were less than usually bad choices, and there were lot a lot of pretty not overdone looks, which is good. I did like Chloe Savigny dress very much.And there was one very good look with white dress from Kate Boswotrh from afterparty. I like Diane's dress very much, but somehow it doesn't look that good with her face to me. I need emily's dress. Need. Seriously, I would give my left leg for that dress – the dress would cover it up anyways! !